Well, I don't have a pool but this is the last of the 4 cards we made through RG Presents on March 11. Yeah, I know, I'm posting this late but I finally got it glazed where I wanted it, took pics that refused to upload to Google so took them again and again and finally on the 3 try they uploaded. So, needless to say, it's last to be shown. Originally this card was to open from the bottom but a few of us at the "party" chose to open from the side. At least I can link my products to my shopping cart so you can see them but remember, early May we'll be changing servers and all these links will not work. If you want to see the products you can do a search on the product name BUT many of these products are in the current Spring into Summer mini which expires the end of June and I have NO idea if they'll be in the new Inspiration Book that goes live July 1. Ok, what I did here. 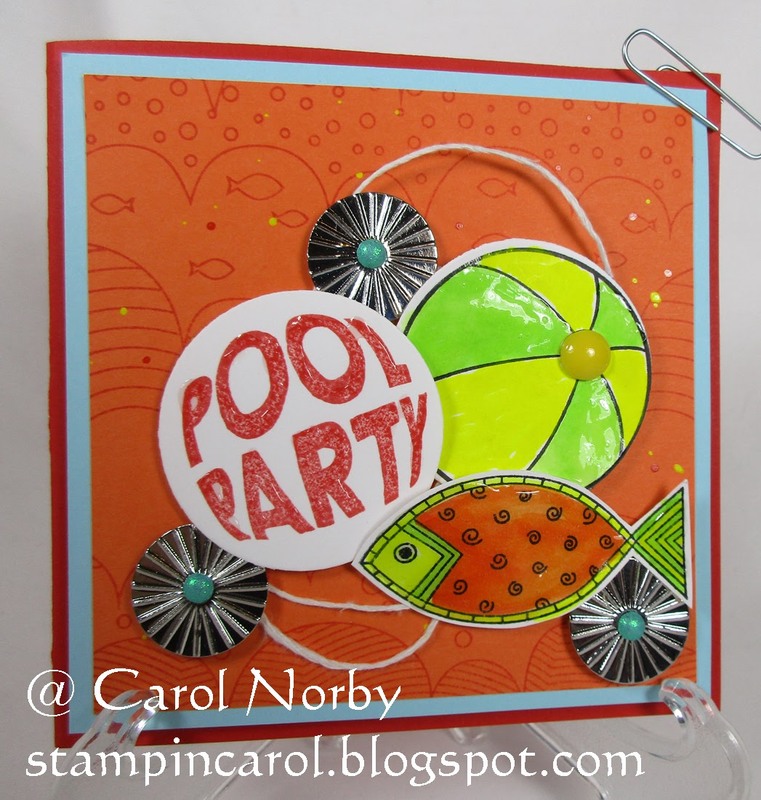 The card base is made of Rich Coral card stock layered with a piece of Pool Play card stock. I stamped the Citrus Cooler card stock with our Catching Waves background stamp using Rich Coral ink. I flicked Sour Lemon and Citrus Cooler Silks on the Waves. 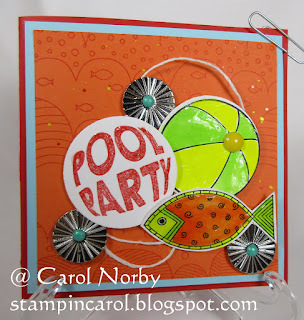 The Pool Party stamp, fish from Artful Fins, and Beach Ball were all stamped on Whip Cream card stock using Rich Coral and Black Licorice inks. I colored the beach ball and fish using assorted Silks and Splashes using my Blender Brush. I used some Whip Cream Thread under the stamped items and added some Metal Accents along with some Journey Brads. That's a Candy Dot on the beach ball. I did glaze sections of the ball, the words and the fish. That's a lots of products on the cover of this card but it wasn't difficult in the least to do and the effect is fabulous! The inside is a pop out and it was made by just cutting a slit starting on the folded end then folding to the side. I had to look at my Journey Blooms die as that's what made the splashes. Yep, they are the leaves! How clever! I again colored and partially glazed the ball using the same products as on the cover and I glazed the splashes. I need to stamp the inside but haven't yet decided with what. Any suggestions?